This recipe like many others on Nola Cuisine is written for folks like myself who love the food of New Orleans, but are too far away to walk out their door and have someone else do the cookin’. I’ve had a hunger for a Roast Beef from Parasol’s ever since my trip last March, but since I live in Michigan, this is a major problem, so I decided to put together a recipe to make my own, based on the video below of Parasol’s owner Jeff Carreras making the Po Boy at the restaurant. I made a recipe based on what I saw, although pared down so that it will work for the home cook. This isn’t a fancy recipe, but I would say most authentic in it’s preparation to what you will find in a lot of neighborhood restaurants in New Orleans, the first bite took me right to Parasol’s in the Irish Channel. I am totally aware that the host in this clip from the food network is a total Stooge, but this little video is a god send. The owner of Parasol’s graciously shows us how to make their Roast Beef Po Boy, granted we have to listen to that bleach blonde goon yammer through the whole video, but it is almost worth it. This is an unpretentious, neighborhood recipe. Some may lift their nose to the Kitchen Bouquet and some of the preparation, I swayed a little myself, but the end result is totally authentic. Try it for yourself, you’ll be moanin’ in your seat with a land fills worth of gravy stained napkins around you. I promise. 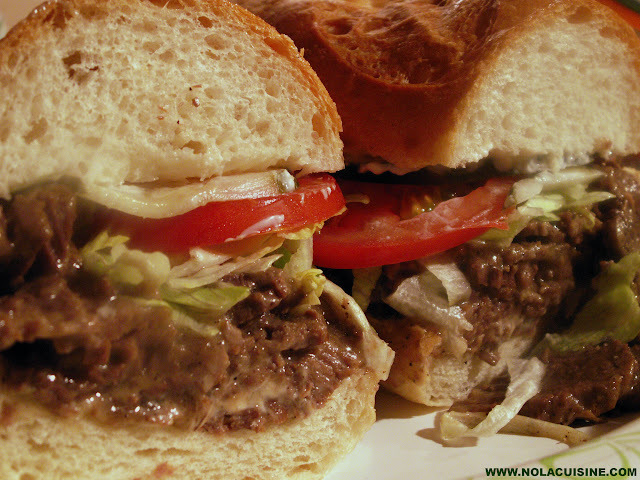 A note on New Orleans French Bread, or Po Boy Bread. I was fortunate enough recently to locate an acceptable substitute for New Orleans Po Boy or French Bread at a local market. Not exact mind you, but it has a lot of the same characteristics, Crisp, yet chewy Crust, soft center, cotton candy-like as it is often called, and just the right size. I’ve tried and tried over the years to create a recipe that is close, but I’m on hiatus from that mission for the time being. You wouldn’t believe the amount of emails I receive asking if I have the magic recipe. Not yet, sorry. The object of the Po Boy Bread in this recipe is to make the eating experience as messy as possible. 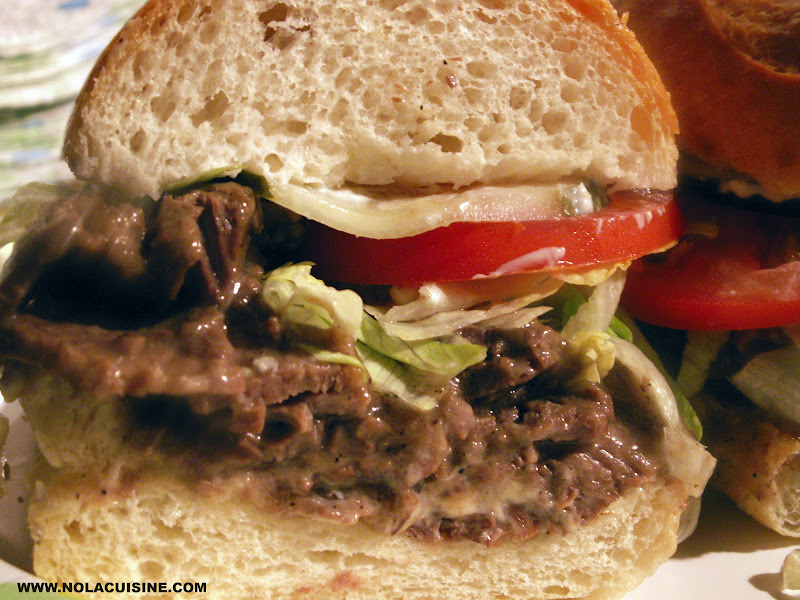 During your first bite the sandwich should flatten somewhat and your hands (as well as chin and possibly clothing) should be awash with gravy, beef debris, mayonnaise and possibly a few shreds of lettuce as the contents spray from the sides as if the sandwich was stepped on. Relax and enjoy, resist the urge to reach for that over sized stack of napkins until the last morsel is gone. In my humble opinion, the best Roast Beef Po Boys in New Orleans are judged by the amount of napkins used to clean up the aftermath. This post is for my good friend Bill Moran, who unfortunately is laid up in the hospital in Corpus Christi. I wish I was close enough to bring you one of these my friend, I hope you get home soon. Bring the water to a rolling boil. Add the beef roast, when the pot comes back to a boil, reduce the heat to medium to medium high, you should have a heavy simmer. Cook for about 1 to 1 1/2 hours. Remove from the liquid and refrigerate until cold. Reserve about five cups of the broth, you won’t need all of it, but keep some to thin the gravy out if necessary. While the beef is cooling make the gravy. Bring 3 cups of the reserved cooking liquid to a boil in a small saucepan. In a small bowl whisk together the flour, garlic powder, black pepper, salt, then the oil and kitchen bouquet, when thoroughly blended, whisk the mixture into the boiling broth, whisk together well, and bring to a boil, then reduce to a simmer. If necessary add a little of the reserved broth if the gravy is too thick. It should be. not too thick, not too thin. Let the gravy simmer for 20-30 minutes adjust for seasonings, it should have a good amount of salt as the beef has none. Cover the beef with 2-3 cups of the gravy. Place into the oven 45 minutes to 1 hour, or until the beef is fall apart tender. Slice the bread in half lengthwise and lay both halves side by side. Slather a bunch of mayonnaise on both sides (I’ll be the cholesterol devil on your shoulder: Come on, your doctor’s not lookin’, don’t be stingy!). On the top half, add pickle slices, tomato slices, and 1 Cup of the lettuce. On the bottom half, add 1/2 of the beef and gravy mixture (please note, I super-sized the amount of beef in this recipe). Fold the top over the side with the beef and put on a sheet pan. Repeat with the second sandwich. Place the sheet pan in the oven for 2-3 minutes to crisp and warm the bread. Cut each sandwich in half and serve on paper plates for authenticity. Serve with your favorite cold beer, Barq’s in a bottle, Zapp’s chips, and a big ole’ pile of napkins. Enjoy! Serves 2 hungry eating machines, or 4 light weights.